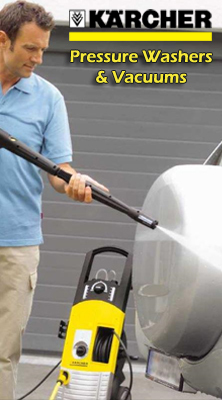 The KÄRCHER 200 plus is an entry-level model with a maximum pressure of 100 bar and a water flow rate of 300 l/h to easily deal with obstinate dirt and stains. Although it is very competitively priced, this unit model comes with a number of fine features. This includes the pressure switch control which turns the motor on and off when the trigger gun is opened and closed. This means that the user no longer has to walk back to the machine to switch it off, it helps reduce water and electricity costs and extends the life of the pump. A chemical injector enables detergent or shampoo to be picked up from a separate container and applied in the low pressure mode, e.g. for car washing. The unit provides high pressure for powerful cleaning and low pressure for rinsing or gentle-action cleaning and applying cleaning chemicals. Accessories offer further benefits. 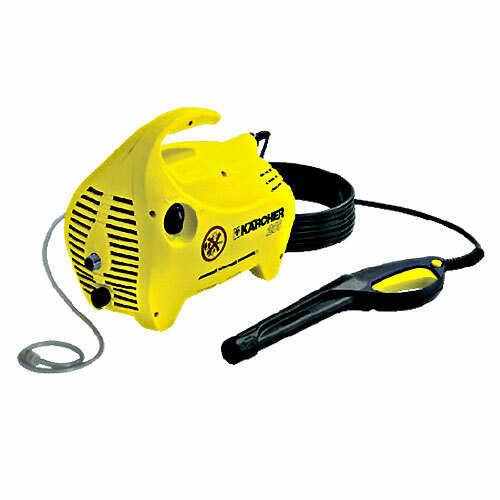 The Dirt Blaster, which combines the power of the solid pencil jet with the area coverage of a fan jet, achieves excellent results in no time. Totally enclosed by high-impact plastic cover - Protection from dirt and damage, free of corrosion, impact resistant, recyclable . N-Cor-Pump, cylinder head of firm polyfiber-plastic - Outstanding efficiency, low noise level and weight . Three piston pump (axial) - Matured pump construction, optimum efficiency, maintenance-free. Safety valve - Protects them unit from pressure exceeding. Motor-Stop - Machine stops, when gun is closed, relieves high pressure system and motor . Large on/off-switch - Easy to handle. High-pressure hose with protective rubber sleeve, pivoted trigger gun - High-pressure hose stops annoying problem of twisting. Ergonomic gun design - Enhance operator comfort, fatigue-free working. Injector for detergent - Accurate metering, detergent is applied in low pressure.